How not to lock your bike! 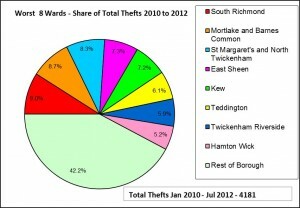 There has been an 152% increase in the number of reported thefts between 2007 and 2012, with a step change in 2010. 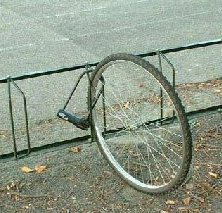 Either the Mr Big of cycle theft has moved into the area in 2010, or perhaps there is better reporting and we are seeing a truer picture? The chart below shows where the thefts have occurred since 2010 (click on the chart to see a larger version). Here at RCC, earlier this year we contacted Richmond Police, with the offer to promote their cycle marking events on our website and in our monthly email newsletter – so far North Richmond, South Richmond and Kew Safer Neighbourhood Teams have taken us up on our offer and we hope others will too. We’ve also produced an updated Bike Security page, with advice on how to lock your bike securely, getting it marked and minimising your chances of becoming a statistic in our next round up in two years time. As a local cyclist shared with us, it’s not fun losing your pride and joy. This entry was posted in Campaign, Security and tagged Campaign, cycle parking, security by admin. Bookmark the permalink.